The sun dips toward the western mountains – everything is backlit in gold. The very trees seem to sparkle as they’re caught in the glow. I’m sitting facing west, outside of the yellow Lonely Lake Hut drinking in the beauty around me. Tui sing beautifully in the tops of my favorite trees – silver beech – and the sound of their wings is a stirring flutter. The dipping sun makes the intricate rock of the surrounding mountains stand out in sharp lines and texture. 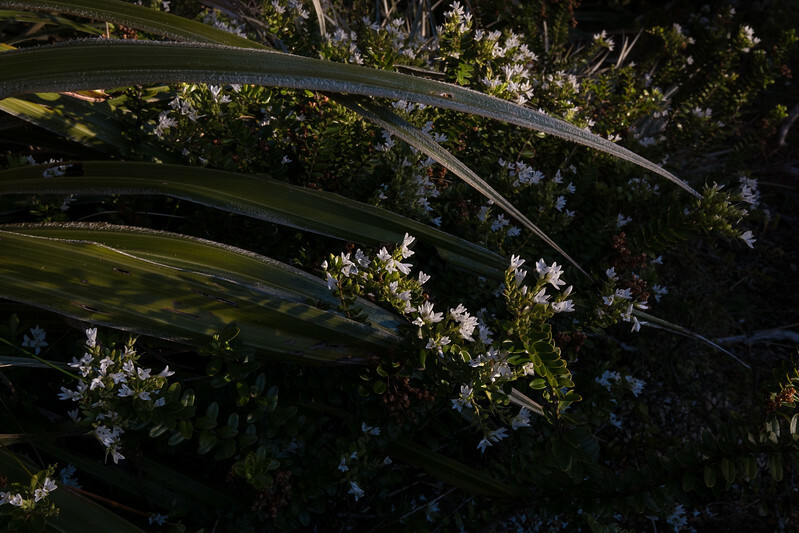 The tussock is gold, the hebe flowers white in contrast, the tree branches are spring green. The day is long, the sun is warm, and the lake is calm. How did I arrive here amidst such beauty? 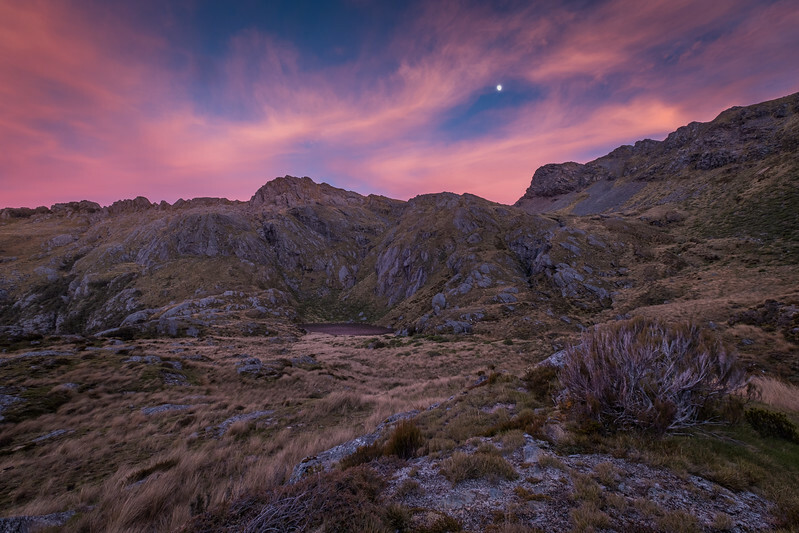 A wild and remote spot hidden in the tangles of Kahurangi where jumbled rock meets the silver forest edge. 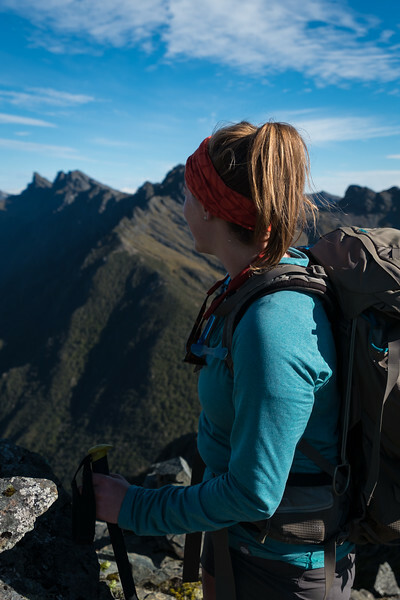 Walking through the beautiful river valley, climbing up subalpine forest paths, sidling beneath the sharp Waingaro Peaks, slipping through loose scree under Kakapo, and strolling atop a fine ridge with 360 degree views: this is what brought me to this place. Of course, this is only the route traveled and doesn’t include the motivation for stepping out the door to begin with. A desire to revisit this place after months of absence, an interest in spending time in my now “backyard” park, and the companionship of a friend to travel the miles with – these things too carried me here. Thought-provoking conversation always seems easy to come by on a long journey by foot across open ridgelines. For this is partly why we do it, right? Not only to learn more about a place but to learn more about ourselves and each other in a setting that removes distraction. As we step up and up in the sun and breeze I find myself challenged by questions I’ve not thought of answers for in a long time. Why am I in this place to begin with and what in the world am I doing? I’ve left a lot of things behind in my sojourn to New Zealand and I often question my decisions. Conversation floats from topic to topic and sometimes only the sound of the wind prevails but my mind lingers on unanswered questions. 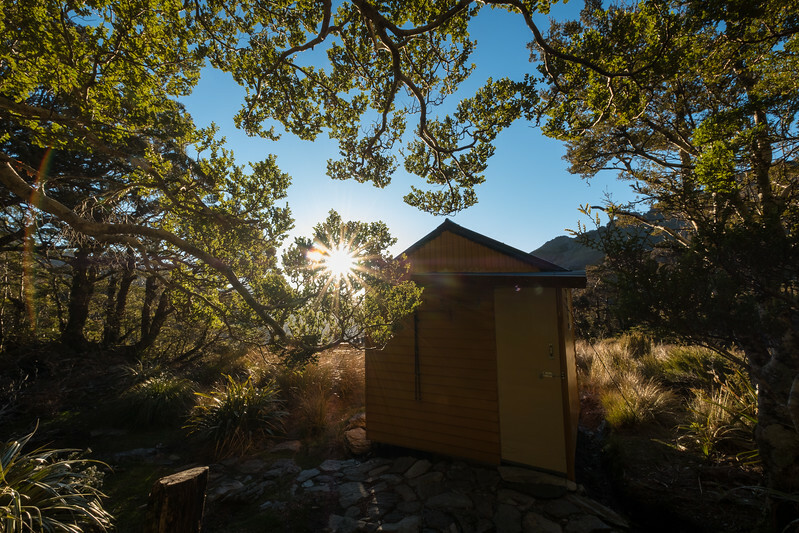 The hut looks beautiful from this angle, the flowers seem magical nestled in the eaves of the forest, the golden light is making even flying insects look like sparks of metallic dust. “Oh, right, this is why I’m here” I think. A renewed sense of wonder is all it takes to set me straight again. Be where you are. Notice the beauty at your feet. Stop filling your head with doubts and listen for the connection between what’s inside and what’s around you. It is as if I have re-opened a creative pathway that has been closed for more than a year. Once again ideas seem to spark with fire and each sunrise holds indescribable beauty. What started with musings at Lonely Lake is being refined with meditation on these elements that define me – realizing wonder, looking for connections, inspiring the soul, and telling stories of meaning. 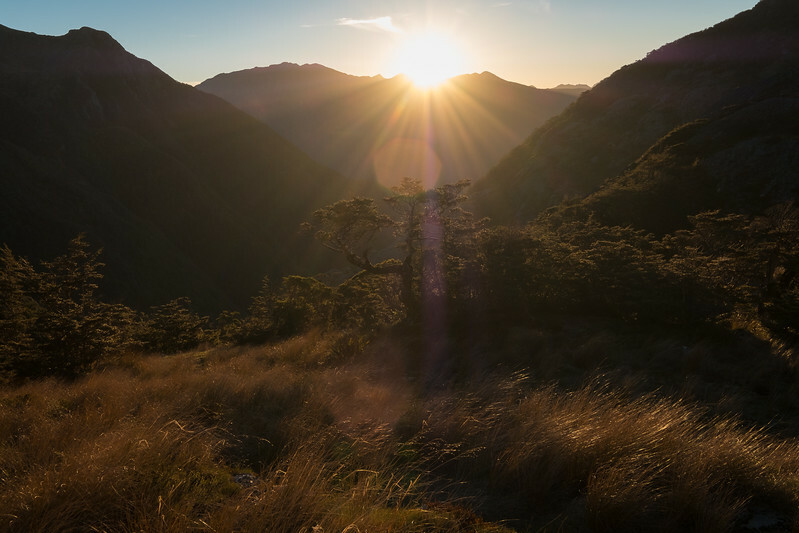 It is re-discovering the heart of what drives our encounters with the natural world in the heart of Kahurangi. As Annie Dillard makes clear in her evocative work, A Pilgrim at Tinker Creek, this discovery can occur anywhere that we are present in the beauty around us. I, for one, found what I wasn’t looking for at the edge of this forest, facing the sun, shielding my eyes from the brilliance to see gold.